Many thanks to Enrica Ardemagni, Christina Green, Rahdne Zola and Di Wu for their contributions to the following selection. Thanks as well to all contributors to past issues of inforMATIon, as well as to those who wrote committee reports, event fliers, etc. Those resources were indispensable in the writing of this history. The Midwest Association of Translators and Interpreters was founded in 2003 to address the lack of ATA representation in Illinois, Indiana and parts of Wisconsin. MATI’s founding members were connected through either ChiCATA (Chicago Area Translators and Interpreters Association) or MICATA (Mid-America Chapter of the American Translators Assocation), having met mainly at the two-day MICATA conference held in 2001 at the University of Wisconsin – Milwaukee (on Saturday) and the University of Wisconsin – Madison (on Sunday). Dr. Enrica Ardemagni, Director of Translation Studies at Indiana University Purdue University, Indianapolis (IUPUI); and Dr. Madeleine Velguth, French professor at UWM, met at the first day of that conference. At that time, UWM’s translation and interpreting program was one of the few in the country with a state-of-the art conference interpreting setup, including a conference room with booths for interpreters and headsets at each seat, enabled for multiple language channels. The first day of the conference included a tour and demonstration of that program. During the second day of the conference, Ardemagni and Velguth also met Dr. Nicholas Hartmann (who would later become the president of the ATA) and Moira Pujols. Their discussions on the need for ATA representation in this part of the Midwest would lead Pujols to call a meeting in Chicago on forming an ATA chapter for Wisconsin, Illinois and Indiana. Janice Becker and Nicholas Hartmann presented at that preliminary meeting held at the Near North Library in Chicago, IL in September 2002 and about thirty were in attendance, including those who had met at the MICATA conference, along with others interested in pursuing the formation of an ATA chapter. It was decided that the division would be incorporated in Chicago, due to its central location, and of those in attendance, around ten individuals offered to complete the paperwork required to become an ATA chapter. Ardemagni would be responsible for writing MATI’s bylaws, and Pujols for filing the necessary paperwork for attaining legal status as a non-profit organization with the Secretary of State. Rodney Bogardus, a Master's student in translation at UWM, would construct the website, and Montserrat Zuckerman would prepare the paperwork that would be used for beginning the member recruitment process. Jeff Gary, a translator at Hamburger University, would be responsible for MATI’s finances and for setting up the organization’s bank accounts. Velguth provided free meeting space throughout the Chapter application process. The founders held organization meetings at Hamburger University (McDonald's Training Center), UWM and via teleconference throughout 2003. Most of the paperwork was completed by email, and after all of the paperwork was submitted, MATI was accepted as a new ATA chapter in 2003. The first elections were held that same year and MATI’s first Board of Directors met on November 22, 2003. Pujols was MATI’s first President, and Velguth the first Vice-President. Gary was the Treasurer and Zuckerman, the Secretary. The first Board of Directors included Ardemagni, Bogardus, Alberto Aguilar, Silvia Fosslien and Sara Vlohovic. The vision the founders had for the organization was to provide a community for translators and interpreters in the tri-state region, with the mission of holding an annual conference that would rotate among the three states. Founders also hoped to offer at least two education events in each state per year, with the purpose of offering members opportunities for professional development and to attain CEUs from the ATA. To benefit members, the founders also envisioned having a website with a membership directory that would show members’ credentials. This would also benefit stakeholders, in that they would have access to a directory of qualified individuals to consult when placing translation and interpreting projects. MATI’s December 2003 Mini Newsletter reports on holiday parties held in Indiana, Illinois and Wisconsin, a tradition that would continue for many years. The members of MATI’s first board accomplished a great deal in the first six months after their installation. 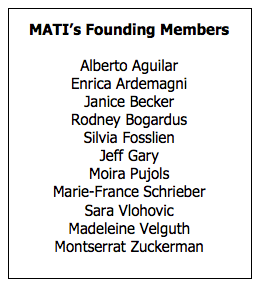 By the December 19, 2003 publication of MATI’s first newsletter, the organization already had 127 members. 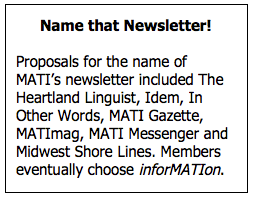 In the newsletter, those members were asked to suggest names for the publication, to replace the generic, “MATI Newsletter.” MATI’s first general meeting was held on February 28, as was its first ATA Certification Exam Sitting. Some of the early goals of the organization included the building of a permanent website and the formation of the various MATI committees (Programs, Communications, Membership). By the time the second edition of the newsletter was published in May 2004 by editor Janice Becker, the website was in its final stages of construction, and the online directory was set to be finished within weeks. That newsletter also shared plans to officially adopt the ATA approved bylaws at MATI’s 1st Annual Conference, to be held July 10-14 at the University of Wisconsin – Milwaukee. That first conference was co-hosted by the ATA’s Nordic Division, and keynote speaker J. Roberto Mendoza held his “Benchside Manners” workshop in a mock courtroom in Milwaukee. Other presentations included Becker’s “Finding and Keeping Direct Clients for Your Translation Services,” Carolyn Washburne’s workshop on editing and proofreading, Sara Vlohovic’s “How Agencies Qualify Translators & Interpreters” and Jost Zetsche’s “Tool Box for the 21st Century – A Computer Primer for Translators.” A number of other educational events were held in the tri-state area in 2004, along with general meetings and holiday parties. MATI’s first logo, designed by member Marie-France Schreiber, appeared in the Summer 2004 Issue of the newsletter, and by the time that edition was published, the organization was nearing a membership level of 150 translators and interpreters. The Autumn 2004 Issue was published under the new title, “inforMATIon.” The newsletter covered a variety of topics during that first full year, including book reviews, interviews and reports on conferences, translation awards and programs. The newsletter also reported at length on Wisconsin’s shift toward state court interpreter certification. The early years of the organization also saw a great deal of participation by MATI members in events that would have long-term effects on the field. In December of 2004, MATI and the ATA co-sponsored a table at the American Council on the Teaching of Foreign Languages Conference held in Chicago. President Pujols staffed the table, and in her remarks on the event (published in the Winter 2005 edition of inforMATIon), she noted that many educators were unaware of the existence of translation organizations. MATI members also participated greatly in the Indiana Commission on Health Interpreters and Translators, an organization formed by the Indiana legislature to study and establish the standards for the education and certification of medical interpreters and translators. Ardemagni was the president of the commission, and MATI members who participated in it with her included Bill Zart, Connie Floerchinger, José Lusende, Marta Rainero, Montserrat Zuckerman, Carol Paddock and Disa Jernudd. MATI held elections in April of 2005, and Barbara Collignon (VP), Silvia Fosslien (Secretary), Brooke Anderson (Director) and Maria Schwieter (Director) joined Pujols, Gary, Aguilar, Ardemagni and Bogardus on the Board of Directors. New Board members were installed at the Annual Business Meeting in July. That year, the website was also updated to include a searchable membership database plus online membership and event registration payments via PayPal. In July 2005, MATI member Cuauhtemoc Gallegos published the Spanish-English Merl Bilingual Law Dictionary. MATI’s 2nd Annual Conference was held in Chicago on September 17-18, with keynote speaker Georganne Weller presenting on “Intermediate-Level Conference Interpreting.” Karin Ruschke presented on “Applying the Tenets of the NCIHC Code of Ethics” and Silvia Schrage on medical terminology. Maria Schweiter presented on medical interpreting, Patricia González on contract awareness, Thomas Mann on legal translation and Jorge Frisancho on “Translation, Transadaptation, Transculturation: The Education Publishing Context.” MATI held approximately fourteen educational events in its tri-state area in 2005, including an educational event in Indiana on February 26, during which Dr. Peter Krawutschke, former President of the ATA, presented on “Translation at the Beginning of 2005: A Look at the Present, Past, and Future of Translation in the US.” He was joined by Hartmann, who presented on practical aspects of technical translation, and by Shiva Bidar-Sielaff, co-chair of the Standards, Training and Certification Committee of the National Council on Interpreting in Health Care (NCIHC), who presented on “Ethics for Interpreters in Health Care.” Additionally, Velguth hosted the presentation “Translation in a Manufacturing Environment” at UWM in Milwaukee on April 16, while the presentation “The Interpreter’s Guide to the Vehicular Accident Lawsuit” was held in Chicago on May 13. Enrica Ardemagni was elected as MATI’s President in 2006, and other election winners that year were Gladys Gonzáles Matthews (Treasurer) and Claudia Samulowitz (Director), along with Bogardus, who was re-elected as a Director. After two years as the editor of inforMATIon, Janice Becker stepped down from her duties as editor, and Bogardus and Marie-France Schreiber became interim editors for the Summer 2006 edition. Suzanne Couture and Saul Arteaga then became co-editors of the newsletter beginning with the Early Autumn 2006 Issue. On January 7, Dr. Madeleine Velguth, founder and former MATI Vice President, was honored at the Wisconsin Holiday Party for her service to the ATA, to MATI and to the Translation Certificate Program at UW-Milwaukee. Velguth had retired from UWM. On February 25, an educational event was held at IUPUI: Cynthia Roat, among the founding members of the NCIHC, presented on “The Growth of a Profession: Health Care Interpreting in the US from 1990 to 2005.” Christina Green and Bruce Goodman were the featured speakers at a MATI educational event held at UWM on March 25. Goodman spoke on the “Code of Ethics for Court Interpreters,” and Green presented on “The Interpreter as Expert Witness.” Madeleine Velguth presented at an educational event held at DePaul University on May 20. Her presentation entitled “Sense and Creativity: Translating the Writings of ‘Literary Lunatics’” was based on the book she translated: Children of Clay (Les Enfants du limon), by Raymond Queneau. Velguth was joined by Kari Lydersen and Susana Galilea, a writer and translator duo who discussed their working relationship and the challenges of translating and interpreting. MATI’s 3rd Annual Conference was held in Indianapolis on September 9, and featured Aleé Alger-Robins presenting on “The Interpreter as Expert Witness,” Edith Matteson on “Translating Children’s Literature: On the Playground of Fantasy and Reality” and Gladys Matthews on “The Translator and Procedural Knowledge.” The conference also featured the panel discussion “English as a National Language: Impact on Translation and Interpretation.” The newsletter began a new monthly feature, called “Say What?” in the Late Autumn 2006 Issue. In this feature, members shared humorous anecdotes from their experiences in the field. By the fall of 2006, MATI had reached a total of 200 members, and approximately six educational events were held by MATI in 2006. Patricia González Maraña was elected Vice President in the 2007 elections, Suzanne Couture was elected as Secretary and Tatiana Botova and Christina Green were elected as Directors. Couture was elected as Secretary in addition to her duties as Co-editor of inforMATIon. MATI acquired a banner to display at conferences and other events, and the Outreach Committee was formed to disseminate information about the professions of translation and interpretation as well as about the expertise of MATI members. By the Annual Board Retreat on June 3, MATI Board members had established a rough draft of the Policies and Procedures Manual, and at that retreat, members approved policies on newsletter advertising, event sponsorship levels and fundraising procedures. MATI and the ATA also co-sponsored tables at a number of events, including the NCIHC’s Annual Membership meeting and the Clarian Hispanic/Latino Health Summit. The organization’s presence at other conferences in the field also extended to the Annual ATA Conference, the Northeastern Center 2007 Latino Summit and the Annual Conference of the Modern Language Association (MLA). An educational event was held in Madison on March 10, during which Doug Swenson presented on the voice-over industry, Shiva Bidar-Sielaff presented on the National Standards of Practice for Interpreters in Healthcare and Georgia Roeming presented on agency promises to clients. The 4th Annual Conference was held on September 8 at Beloit College, and Isabel Framer of NAJIT was the keynote speaker, presenting on “Interpreting Beyond the Words: The Profession Comes of Age.” Framer was joined by Linda Marianiello and Franz Vote, presenting on the program Wordfast, and Montserrat Zuckerman, who presented on terminology management. Additionally, the conference featured a panel discussion on community and conference interpreting, with the participation of panelists Tatiana Batova, Lilian Jiménez-Ramsey and Isabel Framer. Pujols moderated that discussion. In October of 2007, Nicholas Hartmann, a founding member of MATI, became President Elect of the ATA. In an interview published in the Winter 2008 Issue of inforMATIon, Hartmann spoke to the importance of ATA Chapters: “Chapters keep translators and interpreters interested, and their greatest value is to keep them connected with each other and with their profession.” The Membership Committee reported a membership of 183 members at the end of 2007. Di Wu was elected President of MATI in 2008. Saúl Arteaga was elected Treasurer and Gema Aparicio was elected as a Director, as were Marna Rentería and Alexandra Wirth. While founder Rahdne Zola’s (formerly Rodney Bogardus) second term ended in June of 2008, he continued his work with MATI as the Chair of the Membership Committee. (Zola was formerly Chair of the Communications Committee.) Couture and Arteaga were Co-editors of inforMATIon up to the Summer 2008 Issue of the newsletter, with Couture continuing as sole Editor for that issue. On April 5, IUPUI hosted a half-day educational event, which featured two presentations: Cecilia Tenorio on “Translating in the Media” and Dr. Maite Kilpatrick on “Immigration Courts and the Role of the Interpreter.” The ATA and MATI co-hosted a Court Interpreting Seminar in Chicago in June, and the 5th Annual Conference was held in Chicago on September 6. At that conference, Dr. Elizabeth Lowe introduced the Center for Translation Studies at the University of Illinois – Champaign. Other presenters included Ted Wozniak, who presented twice, on financials and retirement planning and on ensuring payments, with Terena Bell presenting on clients, rates and marketing and Patricia Gonzalez and Moira Pujols presenting on the skills necessary to be an interpreter. Alongside the educational events offered for those in the profession, MATI also hosted an outreach program geared toward legal professionals, called “Cultural Competence for the Legal Professions.” As for policies, MATI introduced new multiyear membership discounts in 2008. According to the Quarter 2 Membership Committee Report, membership had fallen to 106 members due to a lack of renewals. InforMATIon reported on a number of significant events in the industry throughout the year, including the continuing development of national certification for interpreters in healthcare, carried out through the participation of stakeholder organizations in the National Coalition on Healthcare Interpreter Certification (NCC) (Spring 2008), and Marella Feltrin-Morris’s successful completion of the nation’s first PhD in Translation Studies, at Binghamton University. In 2009, Lilian Jiminez-Ramsey was elected Vice President of MATI, Green was re-elected as a Director and Elizabeth Colon joined the Board as a Director. Alexis Pollitz became the Editor of inforMATIon and published the Summer 2009 through Winter 2010 issues of the newsletter. MATI briefly considered bringing Kentucky into the organization, as Kentucky was not represented by an ATA chapter at that time and members had made some connections with professionals from that state during the 5th Annual Conference. Wu began a LinkedIn group for MATI early in the year, as an additional way for members to connect. The 6th Annual Conference was held in Indianapolis at IUPUI on September 12, with Karin Ruschke speaking on developments made by the NCC. Ruschke also led a forum on standards for healthcare interpreting training programs, along with Alejandro Maldonado. Dierk Seeburg presented twice, on Quality Assurance and on the use of CAT tools, and Alp Berker delivered the presentation “Working with the Government and European Agencies.” The Membership Committee reported a membership of 111 in the Summer 2009 Issue of inforMATIon. In early 2010, President Wu reported on serving on the job task panel for the Certification Committee for Healthcare Interpreters (CCHI). The job task panel produced a document that defined the medical interpreter’s job description and qualifications, and this document was submitted to all MATI members for peer review. The Winter 2010 Issue of inforMATIon included a report by Ruschke (CCHI Vice Chair) encouraging interpretation professionals to complete a survey being conducted by the CCHI, which would serve to define a standard for certification programs for healthcare interpreters. Ardemagni was re-elected as MATI’s president in 2010. Krasimira Kalcheva was elected as Treasurer, Montserrat Zuckerman as Secretary, and Massimo Gaido, Lourdes Lonergan and Gloria Quintana as Directors . On March 26, George Parker presented for the education event “Court-Ordered Psychiatric Evaluations,” which was held at IUPUI, and on July 17 the educational event “Managing Client Needs and Expectations” was held in Chicago, presented by Kathryn T. Herrick. The 7th Annual Conference was held in Milwaukee on September 11. Nicholas Hartmann, president of the ATA and MATI founder, presented on “The State of the Translation Industry,” and John Hagen and Jason Smith presented on “Forensics for Linguists: Crime Scene Evidence 101.” Alejandro Maldonado updated attendees on the CCHI, Melissa Wallace presented on assessment and training for sight translation in Wisconsin courts and Sasha Federiuk (Carrillo) presented on “Interpreter Fitness and Self Care.” The Membership Committee reported a membership of 103 translators and interpreters in the Quarter 2 Committee Report. Mariza Marcolongo was elected as Vice President in 2011, and Funda (Celik) Aydin, Vicki Bermúdez and Massimo Gaido were elected as Directors. The 8th Annual Conference was held in Chicago, with Christina Courtright presenting on research techniques for translators and interpreters and Jorge Ungo presenting on résumé building. The conference also featured two Table Topic Sessions, during which industry leaders led small-group discussions on a variety of topics. Additionally, the conference featured the expert panel “Agency and Contracting, Business Practices and Expectations from Both Sides,” moderated by Susanne Couture. Kevin McGuire and a representative from SWITS sat on that panel, as well as freelance contractors Vicki Bermúdez, Christina Courtright and Jorge Ungo. In 2012, Christina Green was elected President of MATI, and Directors Diane Grosklaus Whitty, Susan Schweigert and Alaina Sylla were also elected to the Board. The 9th Annual Conference was held at the University of Wisconsin – Milwaukee. Martin Kamenski presented on “Accounting Practices for Independent Contractors,” Anthony Perez on SDL Trados Studio 2011, Tamesia Sosa on “Healthcare Interpreting Roles for a New Millennium” and Ayame Metzger on the Milwaukee Justice Center’s Volunteering Program. The conference also included two Table Topic Sessions, comprising small-group discussions led by members and other participants on a variety of topics. At the conference, MATI members also voted on a new logo for the organization. In February 2013, MATI’s new website was unveiled with this new logo. Schweigert spearheaded the design of the website, which offered members greater control over their directory profiles and a wider variety of content, including a blog and member forums. In May of 2013, Marcolongo was re-elected Vice President of the organization, and Amy Polenske (Secretary), Sasha Carrillo (Director) and Meghan McCallum (Director) also joined the Board. President Green has been collaborating with a number of MATI members to begin a Brown Bag Series of webinars for language professionals. Additionally, after a three-year hiatus, the newsletter re-appeared in a more modern format, as an email sent to members with selections of articles published on MATI’s blog during the previous month. The 10th Annual Conference was held in Chicago on September 21, and Dr. Alexander Rainof delivered the keynote presentation: “Medical and Legal Interpretation and their Interaction – Intermediate and Advanced Translation.” Rainof was joined by Cain Oulahan, who presented on the current immigration environment; Jason Reczek, who presented on video remote interpreting; and an expert panel of Elizabeth Colón (Metaphrasis), Peter Argondizzo (Argo Translations) and Jennifer Arzt and Agie Eldred (The Geo Group), who provided insight on the qualities and marketing materials that make a translator stand out. At the 2013 ATA Annual Conference in San Antonio, President Green announced the location of the 2014 Conference, which will take place in Chicago, Illinois from November 5-8. Additionally, the Medical Interpreter Brown Bag Webinars will kick off on January 24, 2013, when Angela Luther, a Certified Healthcare Interpreter who holds a Certificate of Clinical Competence in Speech-language Pathology, will present on the topic “Speech Pathology and Medical Interpretation.” The ATA has approved 1 CEU per webinar.